With a stay at Hotel Praia Ipanema in Rio de Janeiro (Ipanema), you'll be minutes from Posto 11 and close to Shopping Leblon. 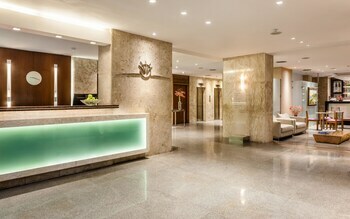 This 4-star hotel is within close proximity of Rio Design Leblon and Oi Casa Grande. Make yourself at home in one of the 100 air-conditioned rooms featuring minibars and flat-screen televisions. Rooms have private balconies. Complimentary wireless Internet access keeps you connected, and cable programming is available for your entertainment. Private bathrooms with showers feature rainfall showerheads and complimentary toiletries. Don't miss out on the many recreational opportunities, including an outdoor pool, a steam room, and a fitness center. Additional features at this hotel include complimentary wireless Internet access, concierge services, and wedding services. Grab a bite at one of the hotel's 2 restaurants, or stay in and take advantage of 24-hour room service. Relax with your favorite drink at a bar/lounge or a poolside bar. A complimentary buffet breakfast is served daily from 6:30 AM to 10 AM. 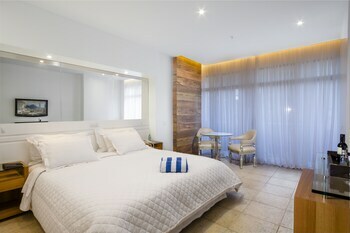 Praia Ipanema Hotel is the perfect Rio de Janeiro lodging choice for your trip to Brazil. With numerous amenities for guests such as 24 hour front desk, fitness center, jacuzzi or spa, you will wake up at Praia Ipanema Hotel feeling ready to go every day for your time in Rio de Janeiro. Don’t let this amazing reservation opportunity pass you by, book your stay at Praia Ipanema Hotel today to make the most of your time in Rio de Janeiro, Brazil.